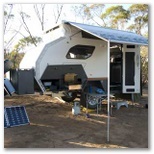 The Independent Trailers Off-road Camper Sales and Hire in Canberra and Southern NSW is located in Chifley in the Australian Capital Territory. Independent Trailers is a specialist operation with extensive off-road trailer experience (over 20 years). We established the business to meet the need we saw for informed and knowledgeable comment on products most suitable to off-road camper trailer travel. We have chosen not to operate from a showroom but from home as this allows us to see clients and demonstrate products out of normal business hours and on weekends which suits a great many prospective purchasers and hirers. Please let Peter and Catherine of Independent Trailers know that you have seen their photos on Caravan Park Photos. Photos on this page were supplied by Independent Trailers and their Suppliers in March 2010. We offer very good product knowledge having used the trailers ourselves in such locations as Bendethra, the Canning Stock Route, the Tanami Track, the Bungle Bungles and the Simpson Desert. We have deliberately taken time to build our business structure and establish our name in 4WD and camping circles rather than compete directly with the usual caravan dealers. We believe that a caravan dealer with multiple brands and models can not possibly provide the in depth, knowledgeable demonstration that these products require. We also cover the outdoor lifestyle show circuit in the ACT and southern NSW. 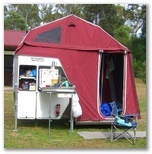 We have intentionally specialised only in Australian designed and made products from Track Trailer and Utility Campers because they are, in our opinion, the best off road campers of their respective types. Our other products are the Auspit; that amazingly versatile and simple Australian designed and made campfire rotisserie and the Tanami Pump series to ease that aching back when transfering fuel. The Tvan is the extraordinary Camper Trailer of the Millennium as awarded by the Caravan Industry Constructors Association. It can go anywhere your vehicle can and has even gone through the Outback Challenge. Because of its off-road abilities and amazingly efficient design it is in the top market segment for camper trailers. 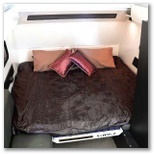 It can be set up in 30 seconds for a quick overnight stop. 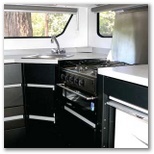 Tvan won the 2009 Hard Floor Camper Trailer of the Year award by Camper Trailer Australia Magazine. The Topaz off road caravan is just what you would expect as the caravan version of a Tvan; rugged, reliable, and easy to use and tow. Come look for yourself. The Camperback from Utility Campers is a very light weight (300Kg) and capable slide on suitable for rugged off-road work. It is compact, comfortable, convenient and can be carried by most vehicles. It has a unique 2-way kitchen. 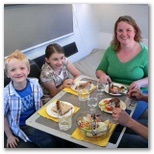 It was runner-up in the Trayback category of the 2009 Camper Trailer of the Year awards by Camper Trailer Australia Magazine. By operating from home we offer a personalised service to our customers and prospective customers and spend some time thoroughly demonstrating our products. We also hire Tvans to provide a try before you buy experience. Because of our extensive experience and genuine enthusiasm for the products we are taken very seriously in 4WD circles where the bulk of purchasers originate.